Guide to Tenerife, one of the ever popular Canary Islands. Tenerife - Located between Gran Canaria and La Gomera about 300 kilometres from the coast of North Africa, Tenerife is the largest of the Canary Islands. Its skyline dominated by the tallest peak in the whole of Spain - Pico del Tiede at 12,195 feet - Tenerife is split into two distinct climatic regions. The north-west of the island is humid and covered in rich vegetation while the southern areas are very hot, dry and rocky. The fine weather of the southern resorts is what attracts millions of visitors to the island each year. Tenerife has an area of 2,354 km2 and a population of around 700,000 (second only to Gran Canaria), the majority of the population are centred around the capital Santa Cruz de Tenerife in the north of the island. The centre of Tenerife is mostly taken up by one of the largest National Parks in Spain, the Parque Nacional del Tiede, spread around a 16 kilometre diameter volcanic crater (Las Cañades) which was formed by a massive eruption some 3 million years ago. Tenerife History: The first inhabitants of Tenerife were from the Neolithic Period in around 3000 BC, some thousand years later came the Guanches (the traditional natives of the Canary Islands), a tall, blonde-haired race of peoples whose origins are largely unknown. The Guanches held control of Tenerife and the surrounding Canary Islands for thousands of years until the arrival of the Spanish and Portuguese in the 14th and 15th Centuries. Tenerife finally fell to the Spanish in 1495 and by the mid-Sixteenth Century the Guanches were virtually extinct. Spain’s hold on Tenerife and the Canaries was tenuous and they came under frequent attack from the slave traders of Europe and North Africa and later by the English under Lord Nelson, who attacked Santa Cruz de Tenerife in 1797 and famously lost his arm during the battle. To rub salt in his wound, his attack failed and Tenerife remained under the Spanish from then onwards. In 1936 General Francisco Franco was exiled to Tenerife by a struggling Republican government, and in the July of that year Franco took control of Tenerife and the Canary islands and thus begun the bloody conflict known as the Spanish Civil War which lasted until 1939. After the death of Franco in 1975 there was a move towards decentralization in Spain and in 1982 the Canary Islands were granted autonomy to control their own affairs. The majority of Tenerife’s economy of course these days comes from tourism and while the tourism industry on the island first emerged at the end of the Nineteenth Century, the real boom began during the 1960’s and 1970’s, when cheaper flights and increased leisure time led to a huge increase in this modern industry. Early tourists headed for the lush north of the island, but a massive investment programme to promote the south of the island resulted in this area becoming the most popular, boasting the sort of weather conditions that sun lovers desire. Today the resorts of Los Cristianos and Playa de las Americas are the best known resorts on Tenerife, together accounting for a large proportion of the visitors to the island. 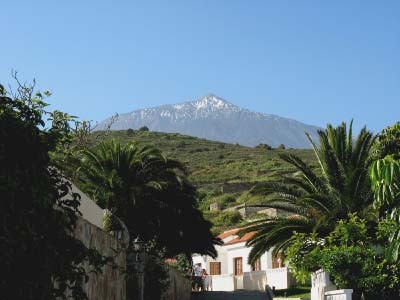 Other resorts include Costa Adeje, Los Gigantes, Puerto de la Cruz and Puerto Santiago. The beaches were not Tenerife’s strongest point due mostly to the dull colour of the volcanic sand and this was resolved by importing better sand from the Sahara Desert to improve the colour and look of the more popular beaches. There are plenty of attractions to enjoy on the island, and it does boast the most visited National Park in Europe (Mount Teide). There are of course some charming towns and villages which you can visit, that are not in the package holiday brochures, one of the prettiest is La Orotava, located in the beautiful Orotava Valley. Other interesting towns in the north of the island include Los Realejos, where the final surrender of Tenerife took place and Icod de los Vinos, famous for its ancient Dragon Tree. Getting to Tenerife is relatively easy and flights are available from most major UK and European airports. Though there are 2 airports on Tenerife, most International flights arrive at the Reina Sofia airport in the south of the island. You can also arrive by ferry from Cadiz on the Spanish mainland or from the neighbouring islands. There are plenty of fine hotels in the main resorts so booking your Tenerife holidays should not be a problem.